The Flame is the most mysterious and powerful entity in the universe. Even the Guardians, in whose hearts Flame burns, who breathe and wield its power, have never seen its Source nor harnessed its full potential. They are content to serve the Light. Arawn is not like the others. He is young, untested, and he seeks more power though a prophecy reveals the predominance of the Flame belongs to another. Arawn is easy prey for Sgarrwrath who lures him into Darkness to corrupt Arawnís Flame to his will. His brotherís, three powerful, incorruptible Guardians refuse to abandon hope. They journey into Darkness, how far will they go to save him? I have always loved to write stories and was blessed with wonderful parents who still encourage me to follow my dreams. To hone my craft, I have taken courses through the Institute of Childrenís Literature and Long Ridge Writerís Group. 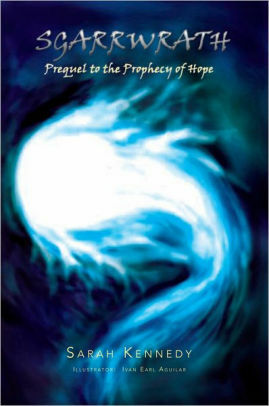 In 2005, I was published in Angels on Earth, and in 2011, I published my debut novel, Sgarrwrath, Prequel to the Prophecy of Hope, which recently received an Honorary Mention in the Halloween Book Festival Competition of October 2013. Today, I live quietly in a small town with my three rambunctious cats. Sarah IS GIVING AWAY A $25 GIFT CARD! This giveaway begins February 26 and ends on March 9. Winners will be contacted via email on March 10.